I have heard of the term ‘Animistic design‘ being used to define interactions between humans and non-humans. I believe that the Human centered design methodologies are limited in how they design with the non-human actors (specifically AI) and that we need to think of ecologies of use where every non-human actor is considered to be at par with humans. This article goes into more depth. Coming back to the paper, it revolved around the design qualities of connected toys in a complex setting of people, objects and data that react to each other. The researchers specifically designed 3 toy concepts which were then analysed from the perspective of animistic design, questioning whether and how the design qualities would foster or inhibit 1) agency, 2) embodiment, 3) a certain ecology of objects and subjects, and 4) uncertainty. Concept A) Was a robot that the children could interact with as a play-mate by programming the robot to move in different directions. LEDs on the robot would give feedback and the children could also personalize the robot using Lego bricks. Concept B) Was a figurine which could interact with many objects (such as cards) and create a virtual avatar and interact with it on an ipad. The figurine acted as an intermediate for the child to interact with the digital world. 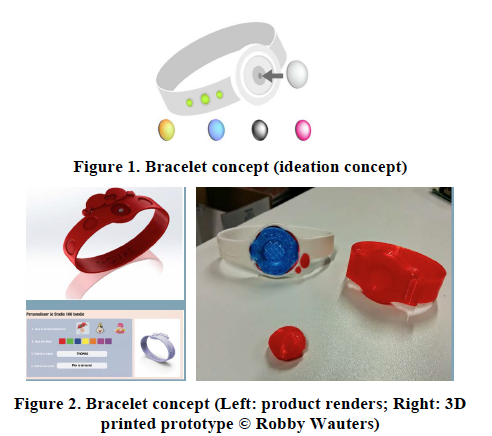 Concept C) Was a smart bracelet which could connect to smart devices. The child could customize and attach different pins and each combination of pins had a unique effect in a game. The bracelet also stored the child’s data and preferences so they could continue play at a different location. Looking at the 3 designs, the authors conclude that the bracelet allowed for divergent interactions, created less dependence on instructions, gave rise to more autonomy and had more fluid boundaries of use which encouraged children to display more agency. The anthropomorphic qualities of the toys created expectations of consistent use, actualizing certainty and predictability. The authors also conclude that the approach requires more grounding in user research for these findings to be validated but there is a rich space for exploration of divergent forms that do not stick to the usual approach of anthropomorphizing connected devices. This was an eye-opener for me and will make me reconsider the product form that we are working on for our finals. With Cozmo, it was love at first sight. SO, when the assignment for reviewing a toy was given to us, I could not think of going with anything else but Cozmo <3. Cozmo is a very popular toy that had massive publicity when it launched in 2016. It was covered by most tech publications (Link 1, Link 2, Link 3) and people (me included!) have been going ga-ga about it. But does the toy hold up 2 years later? Let’s find out! First stop, the cozmo website! Cozmo is marketed as a toy with brains and personality. The home page (Link) talks about cozmo as a an accomplice that fits into your home and the first page has multiple videos of what Cozmo can do. It’s interesting to observe that the videos focus on Cozmo interacting with and doing things instead of its design and looks. Clearly, the company is confident in Cozmo’s personality as the driver for sales. One of the interesting features of animal detection is hidden inside the tech section. They could have brought it up front to convince families that Cozmo would fit into a family perfectly. So, brains, personality, smarts and fun engagement for the whole family (animals included!) Does Cozmo hold up to promises? let’s find out. A lot of the negative issues are because of technical glitches, unresponsive support and quality control. A few parents had an issue of how it was tethered to a mobile phone and they did not want their kids to be glued to a smartphone. This issue is going to be germane to a lot of smart devices in the future. How can we build stuff which does not need the mobile phone as a driver? While most people love the personality of the toy, it gets repetitive after a while. How can developers keep building a personality of a device over extended period of times is a challenge and it will need to be addressed by the creators. Cozmo has a high plateau of engagement. Some kids drop off very early and don’t see the point in the hassle of setting it up and playing with it. Whereas, the ones who have praised it seem to have stuck with it for a while. So, clearly the personality is a hit but the intelligence seems to be quite basic. So i started to look at people who have been hacking into Cozmo and using it as a platform. And guess what! There is an ocean of such content! In my observation, Cozmo has managed to create a small following of people who are invested in the platform but my feeling is that it has the same issues as the Kinect. People don’t see the value upfront as the out-of-the-box execution doesn’t hold up to the promises made but enthusiasts love it for the flexibility and extensibility it offers. I wonder what direction cozmo is going to take from here. With buzzwords like intelligent, smart and AI thrown around, are we setting high expectations from a toy which then fails to live up to the hype? How can we set realistic expectations? Are we diluting what we mean by smartness? What is so smart about Cozmo as most of its behavior feels programmed rather than emergent? How can the behavior of an AI toy feel more organic across time? How can we design the out of the box experience in a way that connects with an impatient kid so that they does not give up on it within a few hours? The creation of a personality is paramount to a smart device. I wonder how the designers, engineers and product development worked to create Cozmo’s unique personality. It’s a great case study and having worked on large teams, I can understand how hard it is to pull something like this off. The tight integration between multi-disciplinary teams is something that I would like to understand more of. I grew up in a small city in India. It was hot, dry and utterly boring in a way that only small cities in 80’s India can be. I was born premature which made me pretty sick through my early years and having no brothers and sisters, I was pretty much in my own head. And a bursting imagination often needs outlets and for me, in came in the form of playing with wooden toys. My family did not have a lot of money, so LEGOs, action figures and toys were out. But as a child, who cared? A few blocks of wood, plastic and boxes and you got a castle going! And in 80’s India, no one around me had any expensive, manufactured toys. So, it wasn’t as if I felt the need to have something that wasn’t being given to me. I was pretty happy in my own head until I saw an advertisement for a GI Joe. GI Joes were probably the first thing I ever wanted. I was entranced and I remember throwing tantrums for having them. My parents couldn’t really afford them so they would try to keep me away but being a male child in India comes with doting grandparents and uncles who would try and cater to my whims. My frustrated parents couldn’t really say anything and in a few years, I had a collection of about 50 of them. But this is not the story of the GI Joes. One summer, while spending the summer vacation at my maternal grandmothers place, I came upon a box which had a small piece of velvet, 2 tiny pillows and a small piece of wood. The velvet was bedraggled with aluminum milk bottle caps stuck on it, the pillows were made out of cloth and the piece of wood, was well, a piece of wood. When I asked my grandmother about it, she told me about how that was a bed for my mother’s doll. My family is one that was torn apart from the partition of India and both my grandfathers had to leave everything they knew behind to start from scratch. So, we never had a lot of money and buying a doll was impossible. But that didn’t stop my grandmother and mother. They made dolls from whatever material they could find, built a bed, a blanket and pillows. My mom grew up playing with a stuffed piece of cloth and treasured it long after she had outgrown them. On that summer afternoon, it all came rushing to me about how entitled was I to ask for an expensive piece of plastic which was way above our means but my parents still tried to do the best they could. I felt the insides of my stomach churn and I had no way to understand what I was feeling as a child but that feeling created a sense of gratitude for them trying to do the best for me in whatever way they could. The little piece of velvet became a part of my GI Joe collection. After a long, hard day of fighting, they all were put to sleep under my mom’s velvet blanket. After all, warriors need to sleep. I often wonder what they dreamt of? What would people who fought all day dream of? Do they dream of peaceful times or more war? And under the glittering, shiny blanket, would they be happy? I did not know but it was fun to imagine that. GI Joes unleashed my imagination. Simulation video games and construction kits later shaped my intellect, thinking and unleashed my ability to make. But my mother’s piece of velvet taught my gratitude, kindness and softness. And for that, I am grateful. Growing up as a man in India, you have a lot of hard edges as a patriarchal, masculine society shapes you to be. But a piece of cloth can round you and round you out like stones in a river. Who could have guessed?